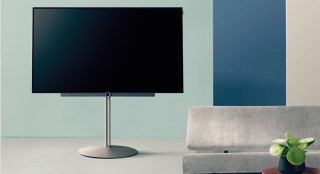 Loewe adds new 65in OLED to Bild 3 range | What Hi-Fi? The Bild 3.65 is 4K HDR OLED with built-in soundbar and a £4290 price tag. From Australia to the UK, Loewe's latest OLED television - the Bild 3.65 - will be hitting stores soon. The 65in TV will join the rest of the Bild range - the 3.55 OLED, 3.49 LCD and 3.43 LCD - at some point this month, toting Dolby Vision, HDR10 and HLG support. These formats help to get the most from your 4K HDR discs, streaming services and broadcast content (we hear there's a couple of minor football matches using it). When it comes to sound, the Bild 3.65 has an integrated soundbar with 80W of power moving the drivers. However, if you'd prefer something bigger - or more private - you can use its Bluetooth connectivity to pair it with wireless speakers or headphones. The Bild 3.65 comes with (almost) all of the expected streaming services: BBC iPlayer, Amazon Prime Video, Netflix, YouTube, Deezer and Tidal all be available on launch, but Spotify is notably absent. The Bild 3.65 is expected to sell for £4290.